Do you have a local food project or idea that you would like to share? Apply to present a “Lightning Talk” during the Local Food Forum! You’ll have 3-4 minutes in front of a supportive audience to share your great idea. We’ll share your contact info with everyone so you can connect with others who are interested in collaborating. 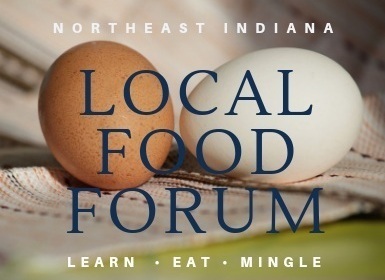 Forum attendees and guests arriving in the late afternoon are encouraged to network and mingle while they enjoy light local refreshments hosted by the Northeast Indiana Local Food Network. 5:00-7:00 PM • Local Food After Party! Join MC Greg Gunthorp as we toast our local scene. Guests can meet their favorite chefs, bakers, producers, brewers, winemakers and distillers and enjoy samples of their latest local food products and creations. Interactive demos by local chefs and butchers and live music will make this celebration a not-to-be-missed event. Watch for more details in the next couple weeks! Registration for the Local Food Forum includes full-day admission to the Forum, Local Food Lunch and admission to the Social Hour & After Party. Attendees are welcome to come and go during the day as they please. Registration for the Forum is limited and will close once seats are filled. Registration for the Social Hour & After Party ONLY (admission after 3pm) is offered separately for those who cannot attend during the day, and will remain open on the day of the event until the room capacity is filled. Be a part of the Local Food Forum!